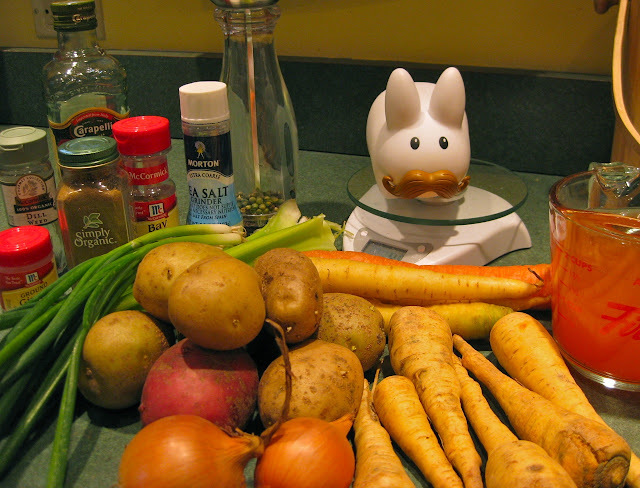 The Labbits are lucky to have access to such wonderful local, organic produce from their CSA program through Deep Meadow Farm, in Westminster Vermont. Part of their fabulous 50 lb winter veggie bag included several varieties of potatoes and parsnips. What better way to stay warm and cozy in winter but with a Potato Parsnip and Carrot Soup? Click here for a printable recipe. Put oil in a big pot and saute onions until translucent. Add in a little broth, the veggies and the herbs and saute for a few minutes. Add the veggie broth, and bring to a boil. Reduce heat and simmer for 30 minutes or until the potatoes and parsnips are tender. Meat-eating labbit option: While simmering, cook up 6 slices of bacon on medium heat about 10 minutes or to desired crispiness. Drain on a paper towel. Chop into small pieces. In small batches, puree the soup in a food processor, remembering to take out the bay leaf first!! 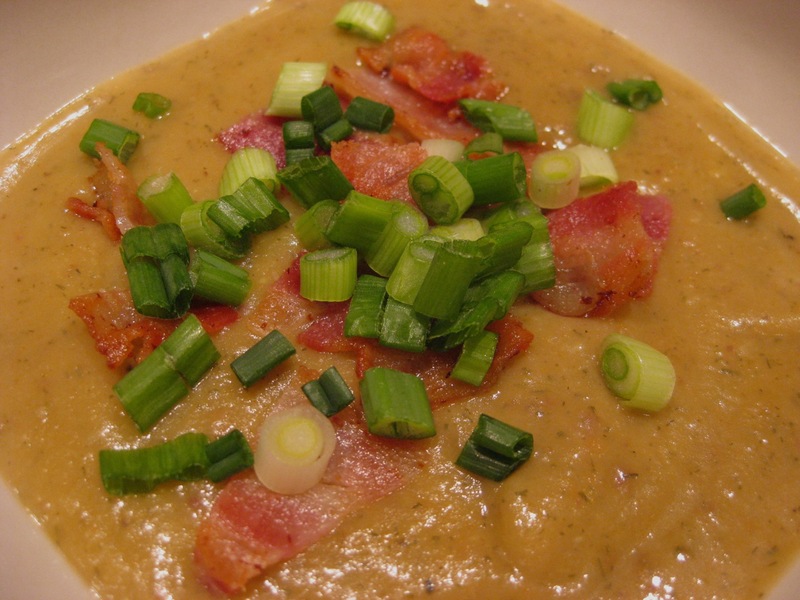 Puree the entire soup, then serve, garnished with bacon and spring onions on top! Serves: at least 4 labbits. 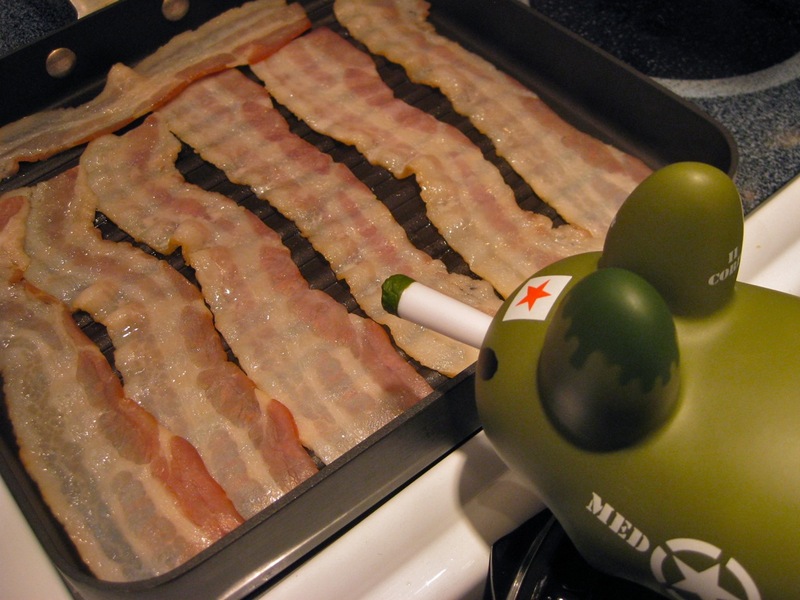 Captain Holly attends to the bacon. "Real labbits eat bacon. Smorked bacon." I made this and Rolf and I both really liked it. The flavour is so full! The bacon is a must. 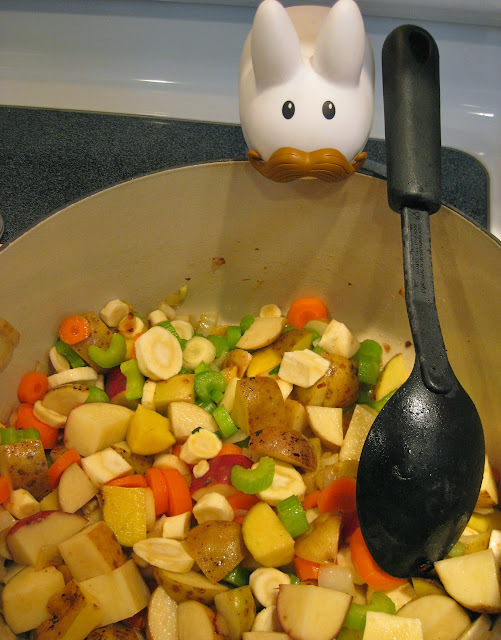 Lisa, Pipkin says to try his latest: curried split pea and potato soup. Captain Holly likes his sprinkled with bacon bits, but it's also good on its own. Thanks for trying out a recipe! Can't Talk Now. Boss Fight.